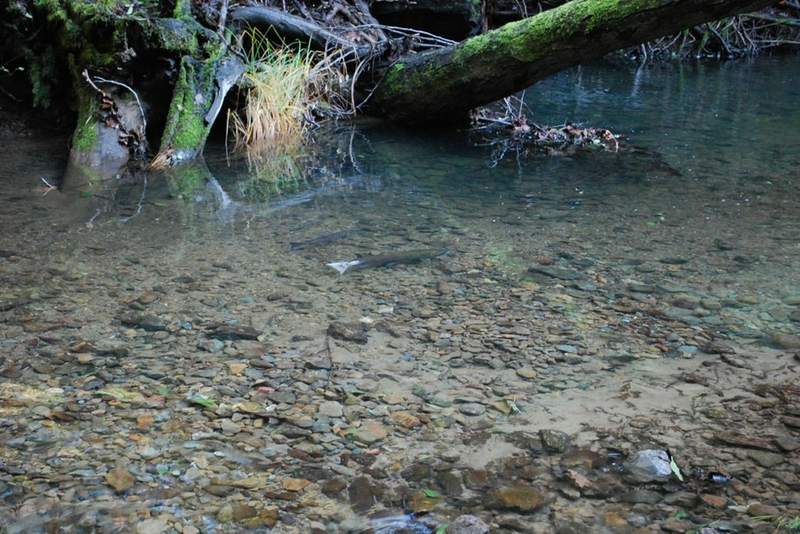 It’s that time of the year again, where our native salmon and steelhead are returning to complete their reproductive cycle in the tributaries of the Russian River. With some rain in the forecast, the river will likely open this weekend for recreational fishing. We would like to take some time to help inform the local community on how to have the lowest impact possible. It starts by taking the time to learn how to distinguish between different species of salmonids, and continues on the water by following local regulations and properly handling fish. Wild steelhead, staying wet and healthy for a photograph. With full grown adult salmon beginning to move back up their natal rivers and juvenile steelhead making their journey out to the ocean, you are bound to have some excitement on the water. During periods when crucial spawning tributaries are disconnected from the mainstem, these fish are incredibly vulnerable to changes in water temperature, predation, and human influences while they are trapped in the mainstem. It is the responsibility of the angler to accurately identify the fish they are fighting and release all salmon and wild steelhead. Besides the regulatory consequences, illegally keeping or harming these protected fish will mean that fewer fish return in the future. Studies have shown that an increase in stress often decreases the likelihood of successful spawning. Equally important is to be cautious of where you walk in the river. Salmonids—which include salmon as well as trout—dig redds, or egg nests, in the gravel when they spawn. This protects the eggs and hatchlings from predators and fast-moving water. Redds contain two main features: a pot, or depression in the gravel (usually related to the size of the female), and a tailspill (mound of gravel downstream of the pot where the eggs are buried). Mature fish release the eggs and milt (salmonid sperm) simultaneously and then quickly cover them with gravel. They will stay in the tailspill for up to 70 days as they mature into juvenile fish. Coho salmon redd. The river is flowing from right to left. The pot is highlighted in red and the tailspill is highlighted in yellow. Although these eggs harden over time, they are very vulnerable to human disturbance, such as a person walking through the creek. Ideal spawning locations often coincide with easy places for people to walk. During the early season redds will be more obvious due to the lack of algae on the fresh digging. We have compiled salmon identification guides for anglers and anyone else who is interested to increase their knowledge and confidence. Please visit the links below! Explore our ID guide and resources to make sure you can identify Russian River salmonids. 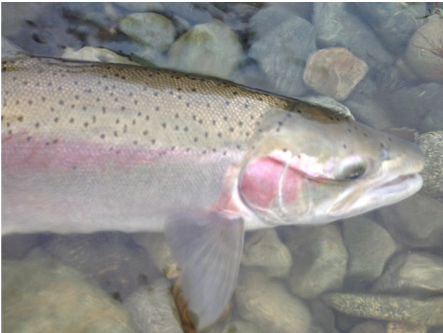 Do you #knowyourcoho? Check us out on social media!